Jump aboard any of the red open-top double-decker buses and enjoy unlimited transport and transfer services while saving loads on transport charges as you explore the city. With buses stopping at all major bus stops in the city, you can enjoy the Milanese life and see the many delights the city has to offer such as the Duomo di Milano, Da Vinci’s Last Supper, the Basilica di Sant’ Ambrogio, the Brera district and many more such sights. Drive through Milan’s charming streets and bask in the rich architecture and culture! Free wi-fi onboard the buses. There’s also a “Sightseeing Experience” App available for free with recorded walking tours. The Hop-on Hop-off sightseeing bus tour lets you do something that a lot of other tours don’t, it lets you plan your own itinerary without having to worry about getting from one place to the next. These tickets are ideal for covering the entire city while saving money and making the most of your time. With an entire fleet of buses reserved for itself, the Hop-on Hop-off network is the largest interconnected sightseeing bus tour in Milan which allows you to conveniently explore the city’s top attractions. If something piques your interest, just hop-off, check it out and hop-on again! With 3 routes spanning across the city, you’re definitely going to be able to navigate through Milan with ease. The three routes are Blue Line, Red Line, and Green Line; your ticket lets you use all three lines. 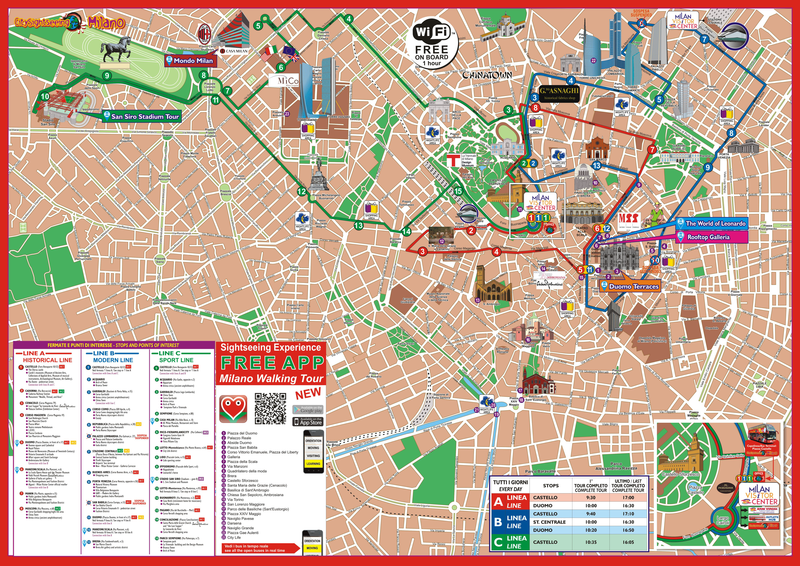 The more popular routes are the red line (Sforza Castle, Cenacolo, Sforza, Duomo, Scala) and the blue line (Sforza Castle, Corso Como, Repubblica, Stazione Centrale, Brera). View a map of all 3 routes here. Sforza Castle - Red Line/Blue Line, Stop #1 The Dukes of Milan were one of Italy’s most powerful rulers, and their home, the Sforza Castle is a proud statement of this power. A military stronghold and the medieval residence of the Dukes, the Sforza Castle is one of the largest citadels in all of Europe. Sant’ Ambrogio Red Line, Stop #4 At the heart of Milan’s spiritual life, lies the Basilica di Sant’ Ambrogio, one of the most ancient churches in Milan built in the 4th century. Quaint, charming and picturesque, the church and its bell tower bring a smile to those who happen to see it. The Red Line, Blue Line, and Green Line run all year long. Red Line - Every 30 minutes from 9:30 AM. Last departure at 5 PM (Nov-Mar) and 6 PM (May-Oct) Blue Line - Every 30 minutes from 9:40 AM (Nov-Mar) and 10 AM (May-Oct). Last departure at 5:10 PM (Nov-Mar) and 10 PM (Apr-Oct) Green Line - Every 60 minutes from 10:35 AM. Last departure at 4:05 PM (Nov-Mar) and 5:34 PM (Apr-Oct) Please note, the timings of the buses may vary depending on traffic conditions and other factors. You may board the bus at any of the stops on any of the three routes. Please present your mobile voucher, along with a valid photo ID to the driver of your bus to redeem your bus pass. We had been on the Day trip to Lake Como the previous day and was lucky to get our same guide- Corrado! An exceptional guide that walked us around Milan with the aid of audio guides so he wasn't shouting and you could hear wherever you were!! The "last Supper" was superb and no waiting so worth the trip. Highly recommended tour!! Last but not least on that tour, you get to go in for your 15 minutes of fame, or at least contact, with that famous fresco, and the tour guide explains the painting in detail. You will receive an email with your City Sightseeing Milan Bus Tour voucher shortly. Simply board any of the sightseeing buses and display the mobile voucher along with a valid photo ID to the driver and redeem for a ticket.